On Saturday, September 16th, we hosted an exciting event for Community League Day 2017 at Koermann Block (10220 96 Street) to create transitory public art at the future home of Artists Quarters. Engagement sessions throughout the summer organized by artist-facilitator, AJA Louden and Arts Habitat’s Community Programmer, Chelsea Boos included diverse artists and supporters. We thank everyone who took part! We can hardly wait to be a neighbour in this community. Pysanky, Ukrainian Easter eggs by Kathleen Day on the North facade along 102A Avenue. The workshop over the weekend began with discussion bridging the history and future of the site, followed by an invitation to participants to share a story, experience or idea contributing to the creation of a mural and other artworks. The Koermann Block is key to connecting the past and future of this important cultural and historic site. Local artists, residents of Boyle Street, and engaged citizens helped build community, celebrate cultural heritage, and collaborate creatively. 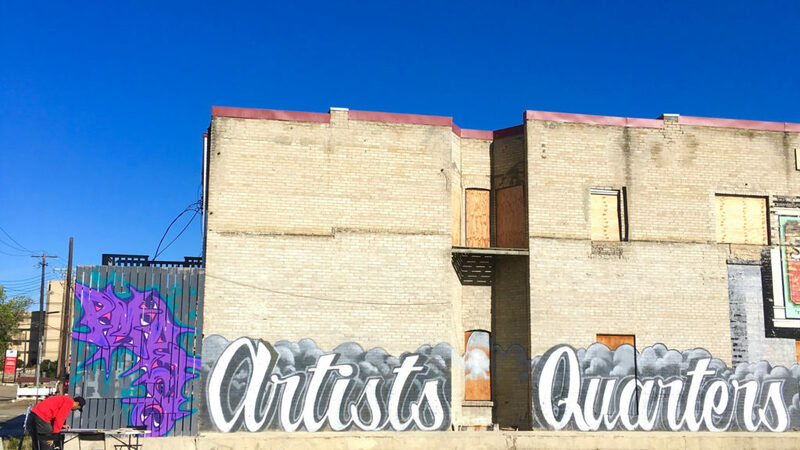 The Artists Quarters project is envisioned as an inclusive, healthy, affordable, accessible, and sustainable artists urban village located in the historic centre of Edmonton known as Boyle Street community, or The Quarters Downtown. The building will consist of multi-purpose studio and performance spaces in the publicly accessible atrium, topped off with a cooperative residential tower. Anchor organizations in this purpose built art space include veteran Edmonton arts organizations, such as Rapid Fire Theatre, Alberta Craft Council, and Arts Habitat. Deconstruction of the Koermann Block will occur once construction funding is secured for Artists Quarters. Before demolition and rehabilitation of the historic brick facades, Arts Habitat and our project team is creating transitory artworks utilizing the panelled windows and doorways of the building, as well as the South-facing exterior brick wall. Artworks may be reclaimed or photographed for potential reuse in the commons of the finished development. Through partners such as iHuman Youth Society, the team has worked with diverse local artists, Evan Brunt, Jordan Ernst, Wade Stamp, Erik Smallboy, Matt Cardinal, and Kathleen Day. The workshop was attended by over fifty supporters and artists such as Joelle Reiniger, Anna Gerrard, Chelsea Boida, Sydney Gross, Nigel Ranger, Alanna Gemmell, Laura Porter, Candas Dorsey and many more!